A new survey by Modernize, a lead generation service, finds that 43 percent of homeowners choose their contractors based on the price of the estimate. The company’s Homeowner Insight Survey on remodeling activity and homeowner behavior gathered responses from 2,500 homeowners in the second quarter of 2018, studying how homeowners choose contractors. The survey found that half of homeowners prefer to gather at least three estimates before choosing a home improvement professional. Forty-three percent of homeowners choose contractors based on price, while 28 percent rely on reviews and ratings. While most respondents did not have a contractor preference, when they did they overwhelmingly preferred small, local companies. 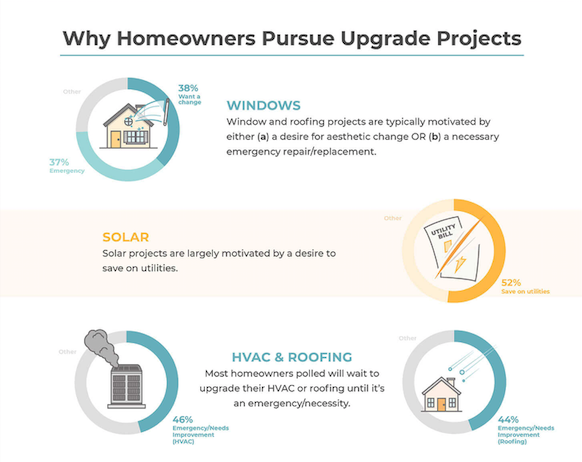 When it comes to the reasons for remodeling, Modernize found that promotions typically do little to encourage homeowners to begin a project, nor do considerations of increasing a home’s value. Instead, homeowners are mostly motivated by practical, cost-saving measures and emergency situations. Homeowners typically replace windows for an aesthetic change (38 percent) or because of an emergency (37 percent). Fifty-two percent of homeowners add solar panels to save on utilities, while homeowners wait for an emergency before upgrading HVAC systems or roofing (46 and 44 percent, respectively). The study also found that 46 percent of homeowners rely on contractors for manufacturer recommendations. In addition, respondents prefer to keep in touch with contractors via phone call.